One of the most anticipated features of 5.2 was the addition of the first new operations boss in two years: Tyth. My impression so far? I love him. No, not like that. 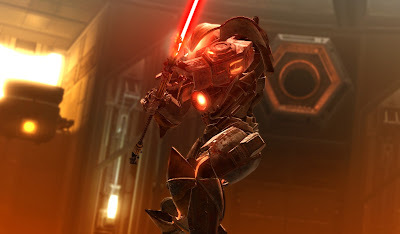 I'd like to start by saying that I was actually a bit worried about how Bioware's first new large-scale boss encounter in years would turn out, even more so after they came out and said that it would be designed by the same guy who designed the Revan fight. No offense, but I'm actually not that fond of that encounter. More importantly though, I still think less of Ravagers and Temple of Sacrifice to this day due to their awful initial tuning, which hasn't actually been adjusted all that much even now, not to mention their propensity for pointless red circle syndrome. Frankly, I wouldn't be surprised if those two operations were at least partially to blame for Bioware's decision to not add any more of that type of content for a long time - raids that unfriendly towards both casual players and mid-level guilds can't have boasted particularly high participation numbers. But enough of that. 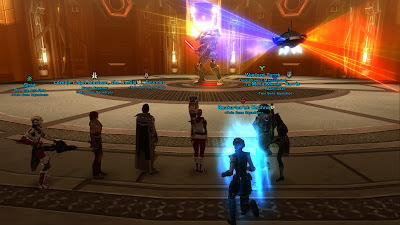 The point is: Tyth didn't disappoint me. When I first went in with my guildies to kill him on story mode, he absolutely melted. 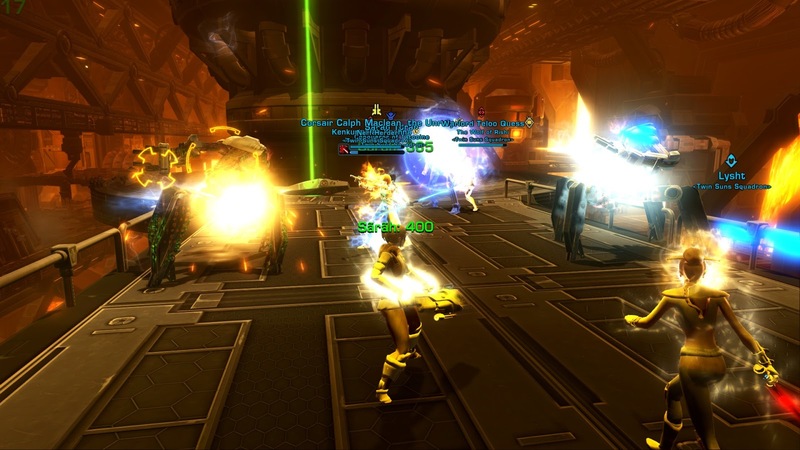 I think people largely ignored the adds, and we quickly caused him to erupt and spew AoE damage, but somehow we just got through it all even as our tank disconnected towards the end of the fight. "That was way too easy," I heard some guildies mutter, but I was wide-eyed with delight. That's exactly how story mode should be to an over-geared, organised and well-practiced group, or else it will be a killer to pugs. In fact, I'm sure there are pug groups wiping on him even now. And that's okay, because this game isn't about always succeeding at everything on the first attempt. But he should be well within reach of even casual players sticking their noses into a story mode for the first time, and that's how it should be. Veteran mode is another story. We've spent some time on it but pretty consistently fail around the fourth wave of adds so far. I haven't minded too much, because I really enjoy the fight. It's chaotic yet straightforward, and while there are several important mechanics to juggle, almost nothing is an automatic wipe if you get it wrong once (unless you get yourself flung off the platform I guess); it's usually a combination of too many mistakes stacked on top of each other that gets you. Not all of my guildies share my enthusiasm. Everyone is entitled to their opinion of course and we can't all like the same things, but at this point I can't help but wonder if we, the ones who have kept raiding throughout the years despite of no new content being added, haven't become a bit complacent. Even though we haven't killed every boss on its hardest difficulty, we're familiar enough with most core mechanics to be able to do them in our sleep. You don't have to be some sort of gaming prodigy to develop a certain level of competence at something that you've been doing literally for several years. Tyth throws a wrench into the works of our well-practiced routine. We think we know it all, but with this fight, we actually don't. I hear comments about how some mechanic is stupid or buggy or random when we've barely even figured out how to do it correctly yet - while in my opinion, the fun is in mastering the newness of the challenge, in daring to try new things because there are only a couple of guides out yet and they might not necessarily have the best strategy for our group. At least that's what I'm looking forward to. What else is there to say? I like the overall look of the operation so far - except for the fact that the entrance is a bit confusing, because the trams aren't marked on the map, causing many a clueless player to immediately click the exit again upon entering, as it's the only door they see. However, I'm chucking that one up to Iokath's general lack of navigational logic more than the operation in specific. The trash is fun - not too tricky, but engaging enough to force you to pay attention. I was somewhat reminded of the droid packs at the start of Terror from Beyond, only with a fire theme. Also, my general impression of this whole "one boss at a time" concept has been much more positive than I expected, largely because we do have just enough of an idea of what encounters are coming next to be curious. SWTOR's social media accounts are also proving unusually adept at teasing us with information, by doing things like post concept art of the upcoming bosses - feeding excited speculation of just what sorts of mechanics these "gods" might have in order to live up to their personalities as described in the lore (see this fantastic post by Rav for more information about that). We'll see if my enthusiasm for wiping and waiting for whatever comes next will abate over time... but for now, Tyth and the Gods from the Machine get two thumbs up from me.